Three separate digital sound sets with adjustable volume include sounds of the collision, sparking/arcing transformer and 1950’s Police sirens. One-button operation starts entire sequence with fully electronic timing. 6-8 week delivery. Pick up only at our New Jersey address or at the semi-annual York Train Show. TMCC or manual operated version available for $1565.00. Own one of our most detailed pieces in years! 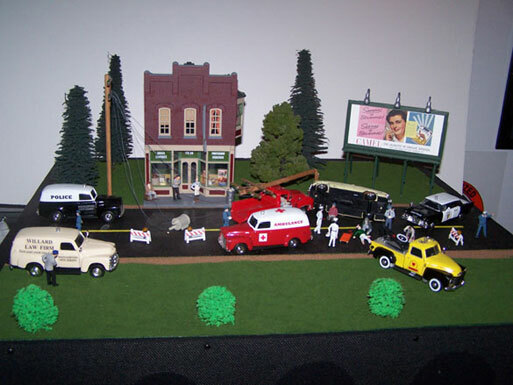 With the touch of a button you can simulate an actual Collision Scene on your layout. You're driving down the road and suddenly you hear the unmistakable sound of a collision between two vehicles. As you get closer you can see the smoke. It must have just happened because the wheels are still turning on one of the cars. It looks as though a power pole has been cut in half by one of the cars. The electrical wires are down and a transformer is on the ground sparking! Better stand back! Now you hear the ambulance and police sirens and you can see the flashing lights as they arrive on the scene to help the injured! The flashing barricades warn you to keep away but you can't help it as you helplessly look on. You'll want to add this amazing animation to your layout. It's sure to attract attention long after your trains have circled the tracks. Pick-up only. Shipping may be arranged for an extra fee, please call.